Species In Genus: 1 sp. : western North America. Etymology: (Greek: false Lithocarpus) Note: Molecular studies indicate closer relationship with Castanea, Castanopsis, Quercus than with Lithocarpus, from which it is now segregated. Habit: Shrub, tree < 30(45) m, evergreen; trunk bark gray-brown. Leaf: petioles 10--25 mm; blade 3--14 cm, oblong to +- ovate, adaxially sparsely stellate-hairy, +- glabrous in age, abaxially fine-woolly, in age +- glabrous, base +- rounded, tip obtuse, margin entire to serrate; stipules early-deciduous. Staminate Inflorescence: spike, stiff, spreading to erect, many-flowered, dense. Pistillate Inflorescence: below staminate inflorescence on same or separate stalk, 1-flowered. Staminate Flower: sepals 5--6, minute; stamens 10--12. 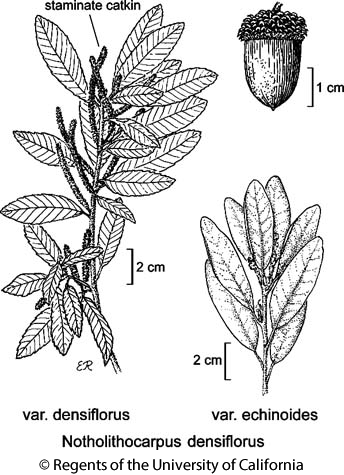 Fruit: mature year 2; nut 1, 20--35 mm, ovoid to +- spheric, partly enclosed by cup-like involucre (cup), remnants of perianth and style persistent as small point at tip; cup (1.5)2--3 cm diam, saucer-shaped, scales slender, +- tapered, reflexed to spreading. Leaf: 3--5(8) cm, 10--30 mm wide. Citation for this treatment: John M. Tucker 2012, Notholithocarpus densiflorus var. echinoides, in Jepson Flora Project (eds.) Jepson eFlora, http://ucjeps.berkeley.edu/eflora/eflora_display.php?tid=91777, accessed on April 19, 2019. KR, CaR, SN; Markers link to CCH specimen records. Yellow markers indicate records that may provide evidence for eFlora range revision or may have georeferencing or identification issues. Purple markers indicate specimens collected from a garden, greenhouse, or other non-wild location.